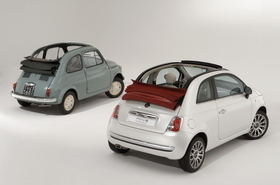 The new Fiat 500 C has a fabric roof similar to the one on original 500 models from the 1950s and '60s. BALOCCO, Italy -- The universal appeal of the Fiat 500 has helped the 110-year company achieve a first: The automaker currently sells more units of the retro-styled minicar outside its home market than inside. “We sell 54 percent of the 500 outside of Italy, something that has never happened before at Fiat,” Lorenzo Sistino, Fiat brand CEO, told Automotive News Europe on the sidelines of the 500 C cabriolet's introduction here Thursday. After Italy, France is the 500's No. 2 market and Germany is third. The percentage of sales outside Italy could rise further in 2011, that is when the 500 will go on sale in the United States. Sistino confirmed the launch date but declined to reveal the expected sales volume for the car there. The 500 is an important part of the alliance between Fiat S.p.A. and Chrysler Group LLC. Earlier this month Chrysler completed a deal that saw its best assets sold to a new company controlled by Fiat. The 500 C cabriolet goes on sale in July in Italy, France and the United Kingdom. The starting price in Italy is 16,600 euros (about $23,150). Fiat expects to sell 5,000 units of the 500 C this year and 35,000 in 2010. The hardtop version of the 500 was introduced in July 2007, 50 years after the original 500 debuted. Sistino says Fiat has sold 360,000 units of the 500 in 59 markets since the car's launch. This year, Fiat plans to produce about 180,000 units of the minicar, which is the same as 2008. Fiat built 3.9 million units of the original 500 from 1957 to 1977. The 500 C will be one of the few open-air cars in the minicar segment. Only the Smart ForTwo offers a convertible variant. Meanwhile, Renault is developing a convertible based on the Twingo minicar that it could begin selling in 2010, a company executive told Automotive News Europe last month. The softtop, including its glass rear window, is electrically powered. The convertible retains the same interior space for four occupants as the standard 500. A stop-start system is standard equipment on the 500 C with gasoline engines. Fiat says stop-start reduces the 500 C's fuel consumption and emissions by 12 percent compared with a 500 without the technology.